This invited post introduces the VALUE project, which I think should be on the radar screen for readers of Play the Past – ed. Hello gamers and archaeologists, we are VALUE: a new research group about Videogames and Archaeology at Leiden UnivErsity. A few months ago, Aris Politopoulos held a great presentation about Videogames & Archaeology at a faculty forum. Among the audience, some of whom have no clue about gaming, a few of us pricked up our ears and thought “Hey! This is cool! We should do something together!” Of course, our initial ideas were centered around how awesome it would be to play games together, but soon enough we started thinking more about possible research projects. There has been significant interest in the blogosphere (e.g. this very site, https://archaeogaming.com etc.) and elsewhere on the intersections between archaeology/heritage and videogames, but within academia there is still a lot of unexplored terrain in the growing field of archaeology and videogames. Therefore, we’ve decided that our main quest will be to bring this subject into the academic world: do our own research, present and publish academically about this subject as well as create an academic arena to discuss actual research. So who are we? Essentially, the core of our research group is four people. Aris Politopoulos (a.k.a. Ymir) , who started the ball rolling, is a PhD candidate working in the Near East on the subject of the construction and use of imperial capital cities in the Late Bronze and Early Iron Age (also check his PlaythePast contribution on Magic the Gathering). Angus Mol (a.k.a. Dr. Random), the only post-doc (hence the Dr.) in the group, is set on the other side of the world in the Caribbean, looking at networks of exchange before and after the arrival of the European colonizers. Angus has previously published a fascinating article on exchange networks of virtual material objects (loot!) in games such as LotRO and D3. Also working in the Caribbean is PhD candidate Csilla Ariese-Vandemeulebroucke a.k.a. Caeda and her specialization is on museums and community engagement. Player 4 is PhD candidate Krijn Boom a.k.a. Megalithic who is mainly working on assessing the value of archaeological activities for the public. We have an honorary team member in Vincent who joins us in testing games. Naturally, our initial reason for centering our research at Leiden University is because we all already work here. But, more than that, this university – and the Faculty of Archaeology in particular – is a strong supporter of our ideas and give us the freedom to experiment and explore this newly created research field. Interdisciplinarity is a core characteristic of archaeology and is highly valued in all the research taking place at our faculty. Videogames in this sense provide a new area of interdisciplinary research for us to engage in. Initially we were not entirely sure how relevant videogames are for the other archaeologists at the faculty, so we started off by doing a brief survey. 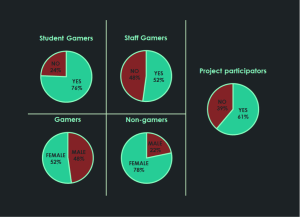 After handing out our questionnaire to 170 students and staff members, we were positively surprised to find that a vast majority of students and half of the staff indicated that they play videogames. In total, 61% expressed the desire to participate in our project. Clearly, we did not need to worry about the relevance of our research group within the faculty. 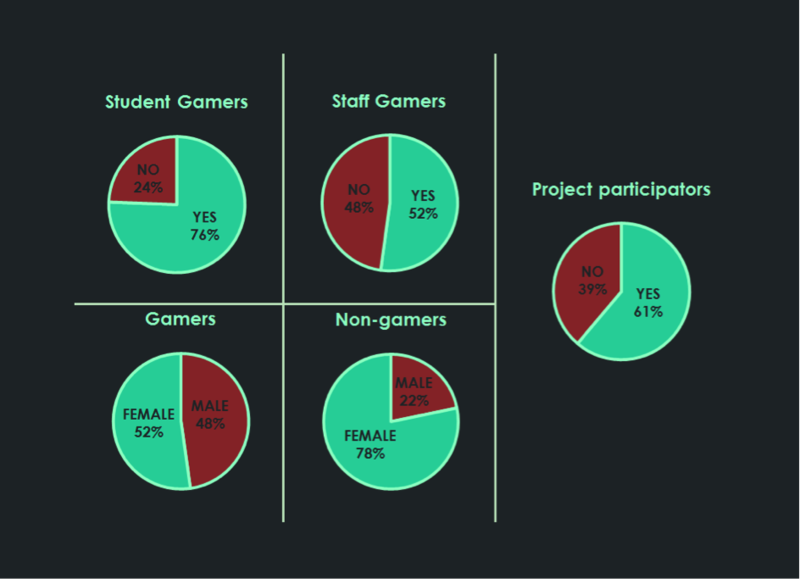 Even more interesting were the gender statistics that prove once and for all that videogames are not just ‘for boys’. After completing our survey, we have started following two major quest lines: communication and playful research. For communication, we are both targeting people within our faculty and those anywhere else in the world. For the former we will be presenting at the upcoming Faculty of Archaeology PhDebates (30 April) and discussing whether videogames are toys or tools. For the latter, we are planning a poster presentation for the Digital Heritage conference (21-22 May, Aarhus). We have also started working on an academic paper which will contain more of our survey results. Further down the line, we are looking to organize a symposium on Videogames and Archaeology. For this, we hope that we will get to know more and more people who have interesting projects to present on – so please contact us if you are working on archaeology and videogames! Our quest line into playful research began with a spontaneous idea for a LAN-party. We played a bunch of games that we wanted to share with each other – many of them not really archaeology related. However, we also ended up doing research when we did a playthrough of the impressive and award-winning Iñupiak game Never Alone. We were so enthusiastic about the fact that Upper One Games so successfully combined oral history with a really good playing videogame and the results of playing through and commenting on this game, that we decided we must do this again. So we will be planning regular ‘Play Dates’ during which we will be live streaming, playing and commenting on games that relate to archaeology, history or heritage. Our next one will be on Saturday May 2nd, starting at 16:00 CEST. As we become more familiar with the field, we will do more in depth research, for instance by applying archaeological theories to game environments. One of the most important goals for us is to be able to share our research and to be able to collaborate with the community of gamers, academics, archaeologists and other enthusiasts around the world. Through our communication channels, we will be sharing our research as much as we can (videos, presentations, papers etc.). We would love to have your feedback, ideas, comments or any other input throughout the project. For now, we could mainly use your input on where the project is headed or suggestions on which games to play. Also, if you are doing research in this field we would love to hear from you! In the future, we hope to open up our Play Dates to invite archaeologists, anthropologists, curators and others to play with us and add their expertise. Once we have been able to decide which topics or games are suitable for more in depth research, we will be reaching out to our faculty and beyond to find participants to help us gather data in game.